Agreement to Official Rules: By participating in the contest, entrant fully and unconditionally agrees to and accepts these Rules, which are final and binding in all matters related to the contest. Whether an entrant receives a prize is contingent upon fulfilling all requirements set forth herein. 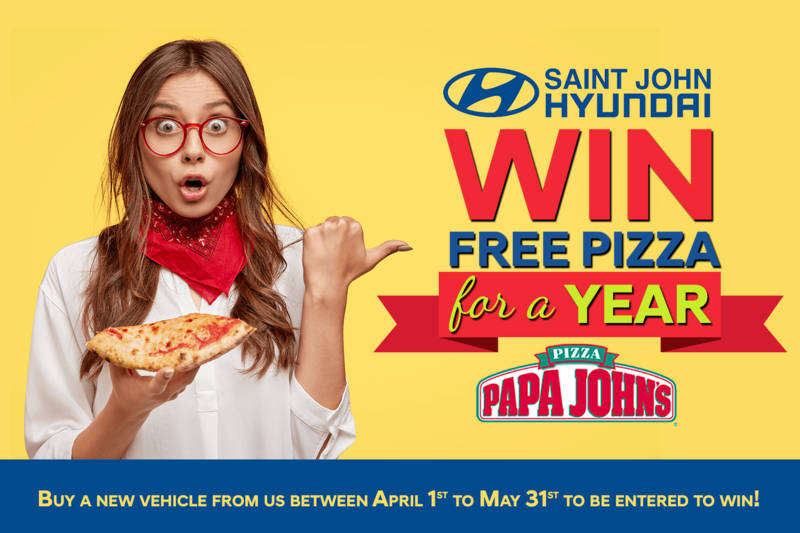 Eligibility: This contest is open to anyone who purchases any NEW vehicle from Saint John Hyundai. Contest Period: Contest period is from April 1 12:00am until May 31st, 12:00am 2019. FREE PIZZA FOR A YEAR Prize: There is 1 Grand Prize of “Free Pizza for a Year” to be won. The prize consists of 52 Papa John’s vouchers; each voucher is redeemable for 1 Large Specialty pizza from Papa John’s Pizza. Odds of Winning: The odds of winning the contest are dependent upon the total number of entries received for the contest period. Waiver: Upon acceptance of the prize, Winner agrees to have their name and photo published on Saint John Hyundai’s website and social media and/or and other promotional materials as part of future promotions. By submitting your email address or phone number, you allow us, Saint John Hyundai, to include you on our contact lists to send you information about our products, services and promotions. You may revoke consent at any time by clicking on the "Unsubscribe" link in your email.